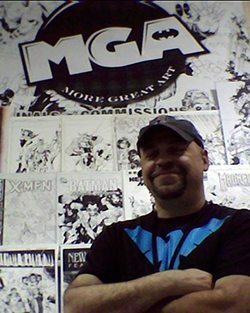 Hi Guys, and Welcome to MGA’s website. I’m Michael Alexandropoulos, owner and founder of More Great Art. Thanks for taking time to check out our website. We feature today’s hottest talent in the industry, representing artists from DC, Marvel, Image, Big Dog Ink, Zenescope and many more. After that another super talent and friend of mine, Dexter Vines and I were having dinner, and as fate would have it, the conversation came up again. And I was once again asking, “How do I get on the bus and stay on it?” Knowing full well that I have no talent for drawing or the patience to write, Dexter pointed out that I did have a talent. It is the “gift of gab”. Thats all I needed to get this fan boy off and running….. Art agent & management. I was very excited, finally something that I was good at. And, most importantly, a way to get that coveted seat on the bus. I asked Dexter to be my first client and he said…..NO. This wasn’t going to be easy as I thought. So I set out like any other new business owner. armed only with an idea and a belief in my self. I wanted to build my agency…my family. Shortly thereafter I ran into a great artist right out of Wildstorm. It was Oliver Nome. I pitched him, and he said yes. Then another artist from Arizona, his stuff was amazing…Keu Cha. I was blown away by it. He said yes. Then came Ale Garza, Jason Pearson, and yes Dexter Vines. They all believed in me. Fast forward three years and some great additions, I finally had my agency….my family. I got on that bus and found my seat. I’ve worked long, countless hours and given everything to be on touring with the band ever since. I’ve been blessed to work and represent some of the best in the industry. Proud to call each one of them client, friend and most of all family. Thank you all. I wouldn’t trade it for the world. Enjoy the site and thanks again for visiting. I’m always at your service.